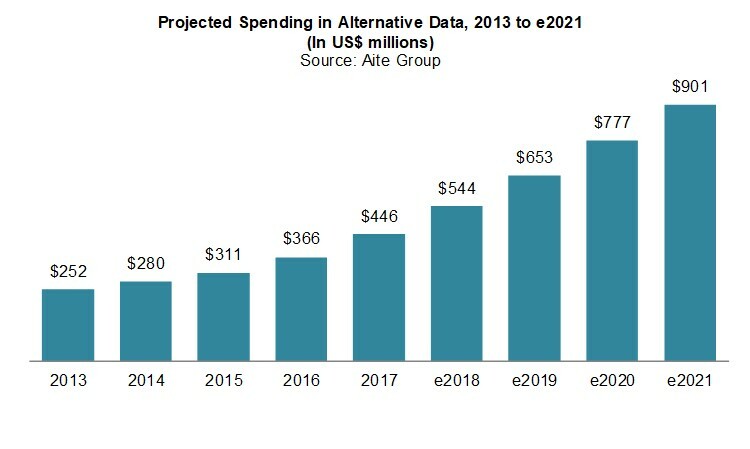 Aite Group expects capital markets spending on alternative data technology to increase to US$901 million by 2021. Boston, October 11, 2018 – Asset managers have a growing universe of alternative data sets that they can use to support investment decisions, and advanced technologies are enabling the processing of these data sets at an unheard-of efficiency level. Every buy-side firm must consider what alternative data brings to the table for its core business when deciding whether to implement an alternative data strategy and which solution provider to work with. This report helps firms to navigate the solutions and shortlist the correct provider for their individual requirements and profiles eight vendors: AlphaSense, Dataminr, Eagle Alpha, IHS Markit, M Science, Prattle, Quandl, and Thasos Group. It is based on 22 Aite Group interviews conducted between March and May 2018 with buy-side market participants, including traditional asset managers, hedge funds, and other types of alternative asset managers. This 44-page Impact Report contains 17 figures and seven tables. Clients of Aite Group’s Institutional Securities & Investments service can download this report, the corresponding charts, and the Executive Impact Deck.